The new series features specimens found among the 4,000-plus species in the college’s collection, which was the site of Monday’s unveiling ceremony. Pictured above, left to right: Palomar College Grounds Services Supervisor Tony Rangel; Palomar College Superintendent/President Dr. Joi Lin Blake; USPS Marketing Manager Christine Carmichael; and USPS San Diego Postmaster Lisa Baldwin. 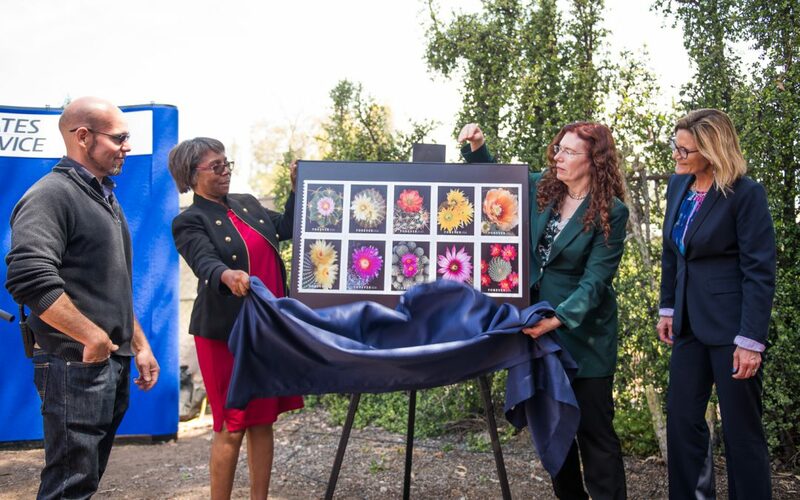 SAN MARCOS, CA ― Surrounded by thousands of species of cacti and succulents at Palomar College, officials of the United States Postal Service (USPS) unveiled the Forever Cactus Flowers Stamp Series during a ceremony on Monday, April 15. Held in the Palomar College Cactus & Succulent Garden, the event highlighted both the new collectible USPS stamps and one of most ecologically diverse sanctuaries of its kind in San Diego County. Guests included Palomar College administrators, USPS officials, and members of the Palomar Cactus & Succulent Society (PCSS), the oldest organization of its kind in San Diego County. Established in 1964 by PCSS, the Palomar College Cactus & Succulent Garden exists on two and a half acres located north of Mission Road and east of Comet Circle in San Marcos. The garden is home to more than 4,000 species, including rare and endangered varieties, and is only open by appointment. Sold in Post Offices as booklets of 20, the new “Forever” stamps feature 10 distinct cactus blossoms, and were designed with photographs by John P. Schaefer, who with Ansel Adams cofounded the Center for Creative Photography at the University of Arizona.